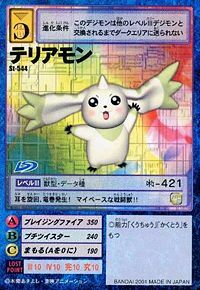 With one horn growing from its head, it is a Digimon shrouded in mystery. It can be classified as a Beast Digimon from its body structure, but it's still not understood what kind of evolved form it will take on. Also, it is rumored that it is sometimes born with a twin. 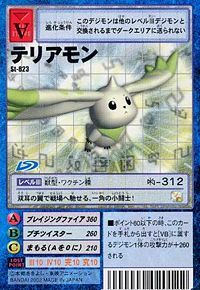 It's a very cute type of Digimon, and from its calm behavior it doesn't seem like a "Combat Species" Digimon, but in the case of battle, it shows that it is more powerful than it appears. 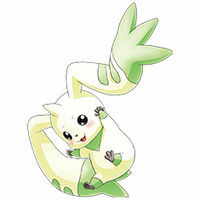 Its Signature Move is generating a tiny tornado by spinning its ears like a propeller (Petit Twister). 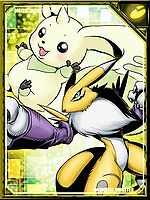 Its Special Move is spewing out a shot of superheated air (Blazing Fire). 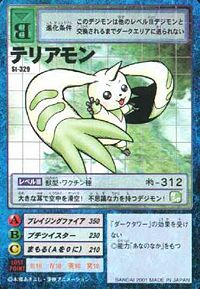 Also, it possesses a powerful might in the Unison Technique Double Typhoon that it performs with Lopmon, its twin. 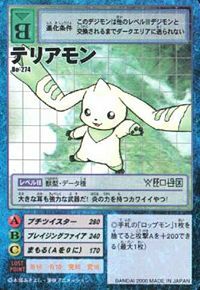 With one horn growing from its head, it is a Digimon shrouded in mystery. 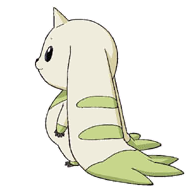 It can be classified as a Beast Digimon from its body structure, but it's still not understood how its form changes throughout its evolution. 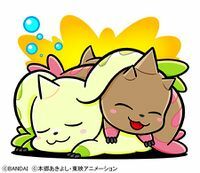 Also, it is rumored that it is sometimes born with a twin. 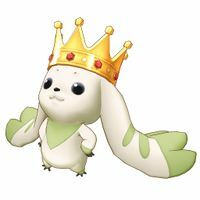 It's a very cute type of Digimon, and from its calm behavior it doesn't seem like a "Combat Species" Digimon, but in the case of battle, it shows that it is more powerful than it appears. 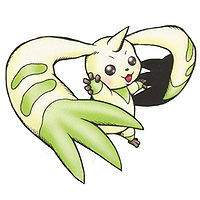 Its Signature Move is generating a tiny tornado by spinning its ears like a propeller (Petit Twister). 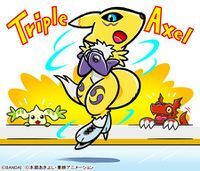 Its Special Move is spewing out a shot of superheated air (Blazing Fire). n., Any of several breeds of dogs, usually used for hunting small game. 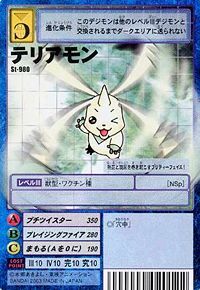 ブレイジングファイア Bureizingu Faia Bunny Blast/Brazing Fire/Blazing Fire Shoots a tiny blast of energy of its mouth. 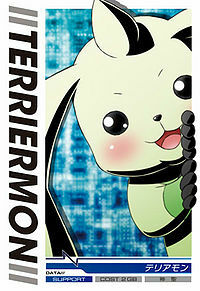 プチツイスター Puchi Tsuisutā Terrier Tornado/Terrier Torpedo/Tiny Twister/Bunny Blast Fires a little turbulence like a tornado. 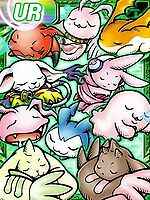 Attacks with Lopmon to create a giant tornado. 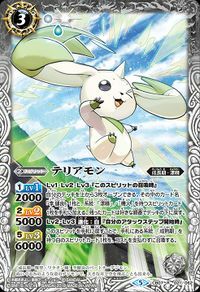 Terriermon is the partner of Wallace and twin brother of Lopmon. 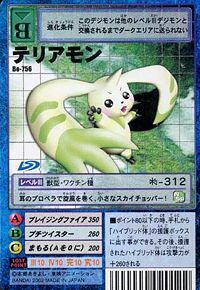 Terriermon is the partner of Lee Jianliang. 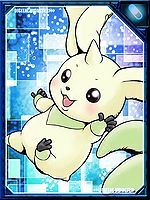 Terriermon is an obtainable Digimon. 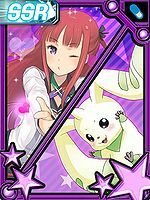 Can be evolved from Nyaromon if you have 20 Beast-AP. 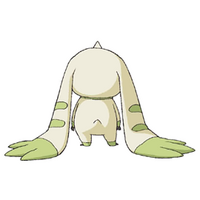 Terriermon only appears in the opening animation of the game. 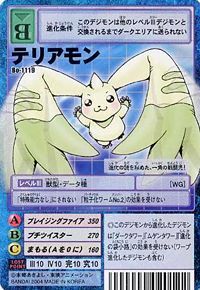 Terriermon is one of the three starters. 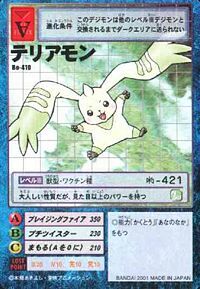 Its attribute is wind. 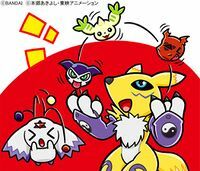 It evolves from Nyaromon and can evolve into Galgomon, Rapidmon Armor, Ikkakumon, or Tailmon. 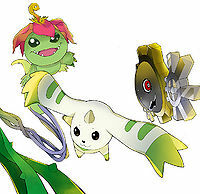 Evolves from Cupimon. 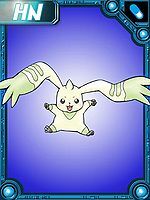 Can evolve to Angemon, Black Tailmon, Devimon, Siesamon, Tailmon, or Witchmon. 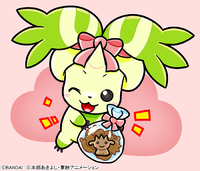 Evolves from Pinamon. 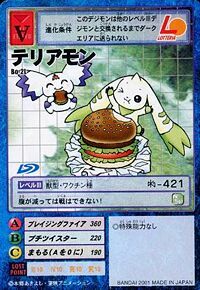 Can evolve to Igamon, Seahomon, Tailmon, or Tyranomon. 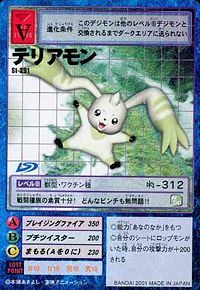 It glides through the air with its large ears! 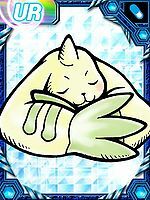 A Digimon that wields mysterious power! It has all the qualities of a combat species! It has no worries, no matter the predicament!! 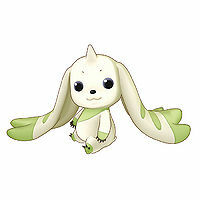 It can spin its ears and create twisters! 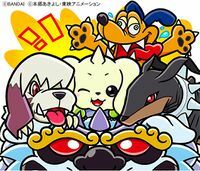 An easygoing battle beast!! 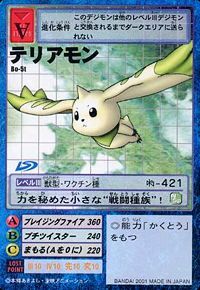 This small, one-horned fighter rushes to the battlefield using its two ears as wings! 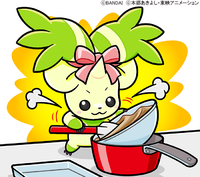 It whips up a whirlwind enthusiastically while putting on a pretty face! 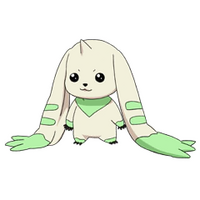 Its large ears also serve as powerful weapons! 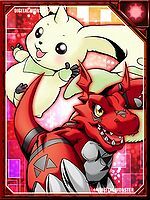 A cute Digimon possessing powers of fire! Although it appears obedient, its power is more than meets the eye. 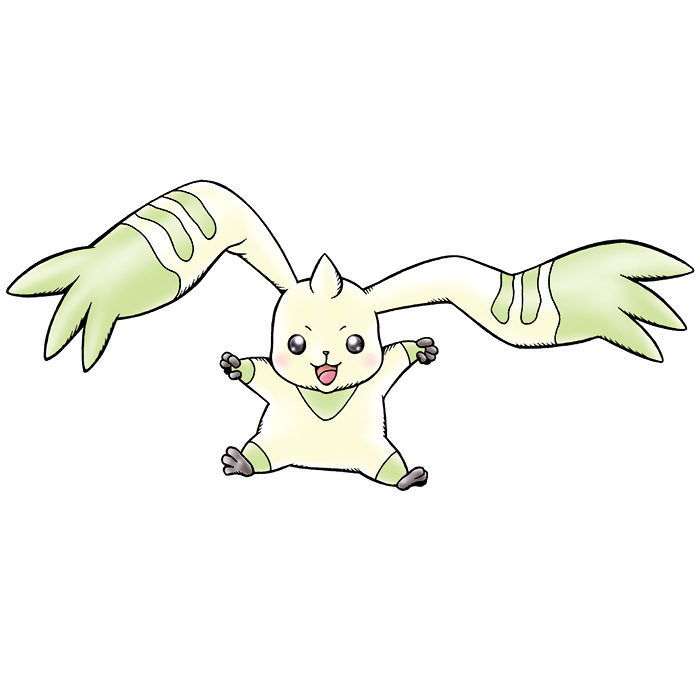 This small sky chopper uses its ears as propellers to whip up a whirlwind! 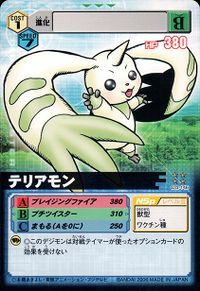 This one-horned fighting kid hides within it the mystery of evolution! This small "battle species" has hidden power! 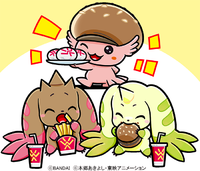 You can't fight on an empty stomach! 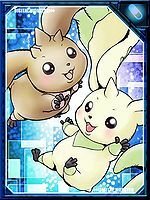 Although this Digimon's evolution is shrouded in mystery, rumor has it that it is occasionally born with a twin. 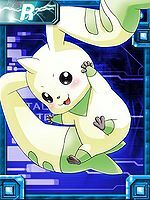 Despite its cute appearance, it is a Combat Species Digimon that hides great power. 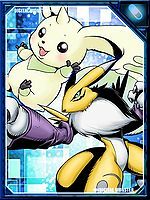 Lee Jianliang's Partner Digimon. 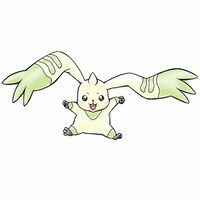 A Digimon with a plush-like appearance, it is capable of flying in the air using its large ears. 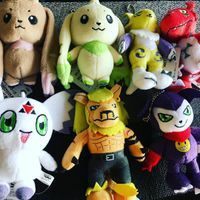 This page was last modified on 25 April 2019, at 09:10.